Here I tried to re-create the cheese ice cream but was not successful at researching a recipe that sounded legit. At first, I couldn’t pinpoint the type of cheese used for the ice cream of my youth. But soon I was horrified to read the “cheese” used in today’s commercial ice cream. I will not go into it because that would comprise of a full pledge post. Refocused, my research pulled up variations with cheddar, gorgonzola, goat’s cheese and parmesan – there were plenty! 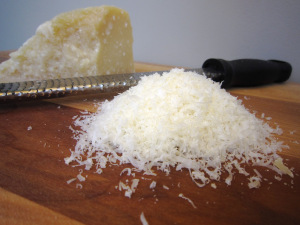 Parmesan came the closest to the taste I was looking for: a little sweet, a little salty and a little nutty. 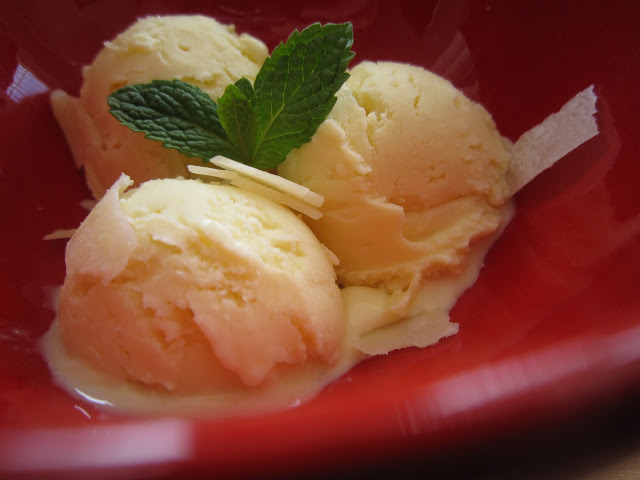 I had also been planning on doing a corn-based ice cream – so I thought, why not? This is ice cream, so whom are we kidding here? There’s just no way these are figure friendly even if you add “fat free” ingredients. I agree that it does take longer because you have to make the custard and cool it – but I think the payoff in taste outweighs the time. It’s like eating something for the sake of eating and not really thinking about if it is really worth the price you pay in $$ and in calories. It’s one more ingredient you are adding - is egg really expensive nowadays? Those of you who have read my previous posts would notice an underlying theme here: It’s all or nothing – so do it right. I’m pretty passionate about the quality of ingredients used in my recipes – especially about eggs and dairy. These are 2 main ingredients in which the difference in taste is notable. If you try to make this recipe, I encourage you to purchase a vanilla ice cream in the supermarket to compare. You’ll notice the texture to be smoother and less grainy compared to the supermarket version. I’m pretty passionate about the quality of ingredients used in my recipes – especially about eggs and dairy. These are 2 main ingredients in which the difference in taste is notable. If you try to make this recipe, I encourage you to purchase a vanilla ice cream in the supermarket to compare. You’ll notice the texture to be smoother and less grainy compared to the supermarket version. When I made this batch, I was concerned that the flavor of the corn overpowered the taste of the parmesan. My testers gave me varying thoughts on which taste stood out more. I still feel the corn was more pronounced – that’s why I specifically added medium size grated parmesan. The fine grated parmesan worked out better when making the custard because it dissolved faster. I encourage you to feel free to experiment with this depending on which flavor your want to stand out more. This “long process” of making ice cream did teach me a new technique that’s I’ve always been scared about: tempering. 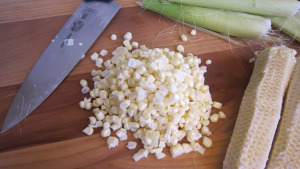 Remove kernels from the corn. Set the stovetop to medium heat. Using a 3-quart saucepan – warm up the milk, cream, ½ cup sugar and corn kernels until steam appears. This will take about 5 minutes. Remove from the heat and blend the mixture until it is smooth. Whisk egg yolks and ¼ sugar until the sugar has dissolved. Next, slowly whisk in ½ cup of the warmed milk mixture into the egg yolks. Do this step until 1/2 the warmed milk is added into the egg mixture. Add the egg mixture & fine grated parmesan into the rest of the warmed milk. Return the pan to the stove and set it to medium-low heat. Let the mixture gently simmer until it thickens enough or until the thermometer reads 180 – 185 degrees Fahrenheit. Prepare an ice bath – using a large bowl, fill halfway with ice and a little water. Put a smaller bowl into the ice bath; make sure that the bowl is big enough to hold the custard. Strain the custard into this bowl. Cool the custard to room temperature, stirring it occasionally to help it cool. Cover and refrigerate until an instant-read thermometer -registers 40 degrees or lower, at least 3 hours or up to 24 hours.